← Are you the bottleneck in your organization? And doing both well usually wins the day. This is one of those arguable insights, where both sides win. Dell is a great example of emphasis upon fast, creating a customized computer in 48 hours or less, bringing in assemblies and components just-in-time to make the assembly line. However, if Dell quality were poor and returns high, the company surely would not have survived on speed of response alone. If someone were to ask, “What is the secret sauce, Michael Dell?” Dell’s response would be something like “Quality custom computers more quickly than the competition.” And in this company example, both quality and speed are the critical factors in competitive advantage. Think of McDonalds. Its reputation is based upon fast food in a minute, with quality that is acceptable but not discernibly above the competition. Or one of the instant auto service companies where an oil change is fast and inexpensive, but the number of inspection points far fewer than at a dealer location. Speed above quality. We have become a society not used to paying even a little extra for speed, but willing to pay much more for quality. How about the $14 hamburger at a restaurant, compared to fast food? 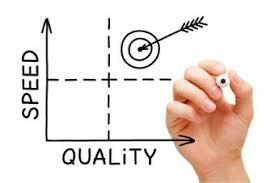 We pay for the quality of product and service, happily defining our own tolerance for cost versus quality and speed. [Email readers, continue here…] So, in planning for your niche to defend, one of the first decisions is between quality and speed. We will soon examine the entire gamut of pricing structures in future weeks, but let’s start with this one. It is fair to repeat that quality and speed together are the winners in this contest, not one alone. Which will you want to accent for your competitive advantage? How will your customers react to your positioning? Will you make more in revenues and profits with one against the other? Where is your competitive landscape? Is there a more aggressive competitor in one (speed) as opposed to the other (quality)? Can you “knock off” the competition in one of these areas more easily than the other? There are great questions for your next strategic planning session or board meeting. Try them. This entry was posted in Finding your ideal niche, Growth!, Positioning. Bookmark the permalink. 2 Responses to Faster is sometimes more valuable than better. I’m not sure it needs to be an either-or. And I would also add “reliability” or something similar to the positioning. If a customer can be assured of quality, speed, AND reliability / support / no-risk / integrity, however you want to position that third ingredient, then that engagement with the customer gives you a true differentiator. I worked for a company that was in a business (graphic arts) where you were expected to deliver top-of-the-line quality, and deliver it fast. What was most important to the customer was “reliability,” being assured that we would meet their deadlines, or would keep them informed minute-by-minute if circumstances arose that would prevent us from meeting the deadline. In that particular instance, timely and honest communication with the customer trumped everything else. Thanks for a great comment. In future weeks, we’ll add to these two and make the calculation more complex. I’ll up the ante from two to five and “reliability” will be covered under “service.” Glad you’re challenging these.